To help our customers develop and prototype their MicronTracker applications, we offer these optional extras. Please inquire about inventory and pricing information. 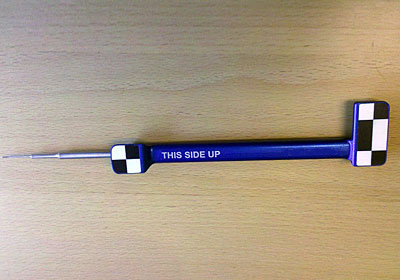 The ClaroNav tool is an ergonomic probe handle with two permanent targets. The entire tool is autoclaveable and extremely durable with a bayonet shaft. 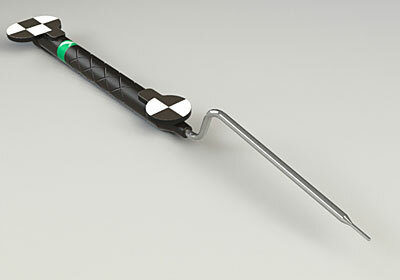 The Pointer is an ergonomic probe handle with two permanent targets. The entire tool is autoclaveable and durable. Limited quantity available. DuraMarks are tracking targets (Xpoints), made of a durable adhesive material tested to sustain over 100 cycles of steam sterilization according to ISO 13402-1995. 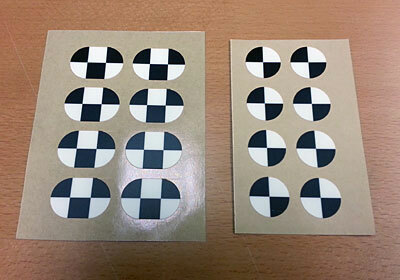 Each kit contains 8 single Xpoints (r=12mm), 8 oval dual Xpoints (r=12mm) and one large “cut your own” sheet with a grid of 63 Xpoints. Multi-facet aluminum reference body with checkerboard patterns permanently attached. 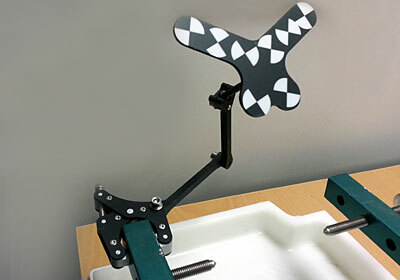 Stable fixation over any shape, and solid joints for easy adjustments.